27 Feb 2018, 12:32 p.m. Yesterday the Pound started strongly against the Dollar but quickly its fortunes switched around. The usual Brexit fears act like a handbrake to the Pound’s growth potential, and with the Federal Reserve hinting repeatedly at an interest rate rise in the next couple of months the US Dollar is slowly and steadily becoming an attractive currency again. Investors and analysts are optimistic for Sterling in the coming months however, following this interview in The Times with Sir Dave Ramsden. The Bank of England deputy governor was one of two who voted against November’s interest rate rise, but the economic growth and stability of the Pound since then have changed his mind, leading to improved odds that another 0.25% interest rate increase will come in May – taking the UK up to 0.75%. While the Bank of England’s decisions are the primary influence for the strength of the Pound Sterling, the Labour Party’s new, softer approach to Brexit could be a bonus boost to the currency. On paper it’s a less radical breakaway compared to the current hard Brexit proposed by the Conservatives. It’s not without risk though. By undermining Theresa May as she approaches the EU negotiations the UK could suffer whilst brokering a deal and be worse off, but the underlying aim is to destabilise the Prime Minister before such talks to then force another General Election. 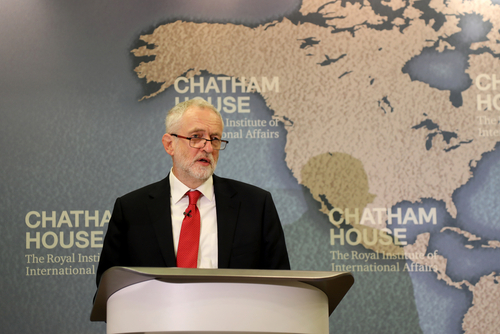 Reuters reports that while Corbyn wants a new customs union, Prime Minister Theresa May has ruled out any such union as it would prevent deals being brokered with the faster growing economies such as China and India. Telling @BBCNews that @jeremycorbyn on #CustomsUnion a small step to sanity. But on #SingleMarket he is still following @theresa_may cake and eat it policy. Just wants red cherries rather than blue raisins. Dr Liam Fox, the government’s International Trade Secretary, will give a speech later today arguing against any form of customs union with the EU.